For other uses, see Lassi (disambiguation). Lassi (pronounced [ləsiː]) is a popular traditional dahi (yogurt)-based drink that originated in the Indian subcontinent. 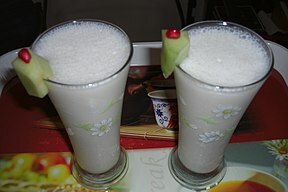 Lassi is a blend of yogurt, water, spices and sometimes fruit. Mint sweet lassi or Chaas in Chandigarh, India. 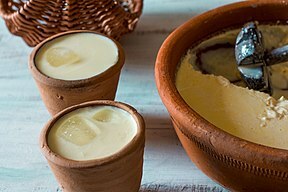 Lassi in an earthen tumbler, Kullhad, Varanasi, India. Benaras-ki-lassi, a style of lassi from Benaras, India. The traditional namkeen (or salty) form of lassi is more common in the Indian subcontinent. It is prepared by blending dahi (yogurt) with water with added salt. The resulting beverage is known as salted lassi. This is similar to doogh. Sweet lassi is a form of lassi flavoured with sugar, rosewater and/or lemon, strawberry or other fruit juices. Saffron lassis, which are particularly rich, are a specialty of Rajasthan and Gujarat in India and Sindh in Pakistan. Makkhaniya lassi is simply lassi with lumps of butter in it (makkhan is the Gujarati, Urdu, Hindi, Sindhi and Punjabi word for butter). It is usually creamy like a milkshake. Mango lassi is gaining popularity worldwide. It is made from yogurt, milk and mango pulp. It may be made with or without added sugar. It is widely available in the UK, Malaysia, Singapore, the United States, and in many other parts of the world. In various parts of Canada, mango lassi is a cold drink consisting of sweetened kesar mango pulp mixed with yogurt, cream, or ice cream. It is served in a tall glass with a straw, often with ground pistachio nuts sprinkled on top. Bhang lassi is a cannabis-infused drink that contains bhang, a liquid derivative of cannabis, which has effects similar to other eaten forms of cannabis. It is legal in many parts of India and mainly sold during Holi, when pakoras containing bhang are also sometimes eaten. Uttar Pradesh is known to have licensed bhang shops, and in many places, one can buy bhang products and drink bhang lassis. Chaas is a salted drink similar to lassi, but may contain more water than lassi and has the butterfat removed to reduce its consistency. Salt, cumin seeds or fresh coriander may be added for taste. Fresh ground ginger and green chillies may also be added as seasoning. Chaas is popular in India where it is a common beverage during or after mealtime. A lassi shop in Uttar Pradesh, India. A 2008 print and television ad campaign for HSBC, written by Jeffree Benet of JWT Hong Kong, tells a tale of a Polish washing machine manufacturer's representative sent to India to discover why their sales are so high there. On arriving, the representative investigates a lassi parlor, where he is warmly welcomed, and finds several washing machines being used to mix it. The owner tells him he is able to "make ten times as much lassi as I used to!" On his No Reservations television program, celebrity chef Anthony Bourdain visited a "government authorised" bhang shop in Jaisalmer Fort, Rajasthan. The proprietor offered him three varieties of bhang lassi: normally strong; super duper strong; and "full power, 24 hours, no toilet, no shower". In 2013, Kshitij, the annual techno-management fest of IIT Kharagpur, launched a campaign to name the next version of the mobile operating system Android, Lassi. ^ "Indian Lassi: The Ultimate Summer Refresher". Imbibe. Retrieved 29 May 2018. ^ Wayne Collins (1970-01-01). "Food - Recipes : Mango lassi cocktail". BBC. Retrieved 2014-01-08. ^ Anthony Bourdain: No Reservations Collection 2, Episode 5; Final Segment. ^ "Can This Lassi Ad Really Be True?". indiablogs.searchindia.com. 2008-10-04. ^ "HSBC Bank : Washing Machine and Lassi". Adoholik. 2008-09-27. Retrieved 2008-10-19. ^ "HSBC Lassi/Washing Machines TV Ad". HSBC. 2012-04-30. Retrieved 2013-09-23.